The 1916 Junior Sophister term examinations were due to be held in Trinity College on Tuesday and Wednesday 25 and 26 April. 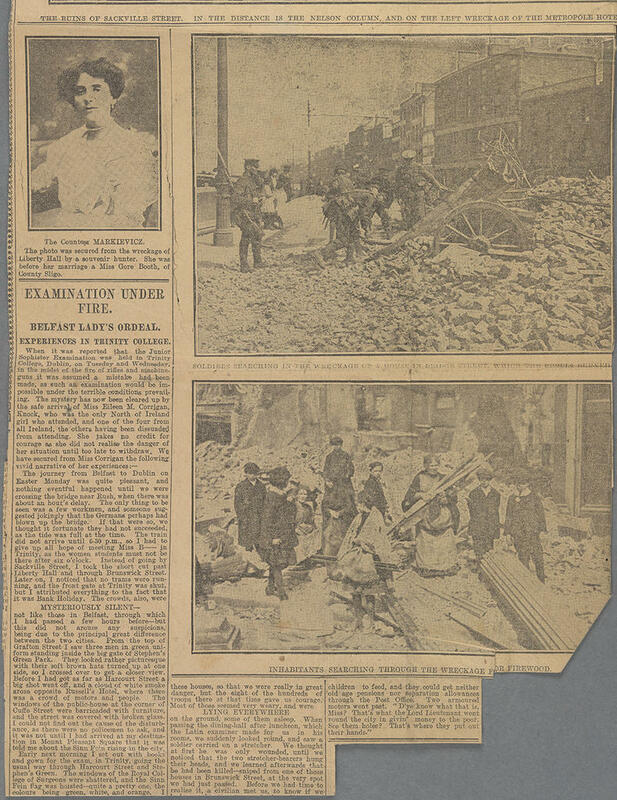 Eileen Corrigan, a student from Belfast, travelled to Dublin by train on Easter Monday to attend them, and an account of her experiences appeared in the ‘Belfast Evening Telegraph’ on Friday 5 May. She describes making her way to her accommodation in Ranelagh, noting that the front gate of Trinity was shut, and that there were three men in green uniform and brown hats standing inside the main gate of St Stephen’s Green. 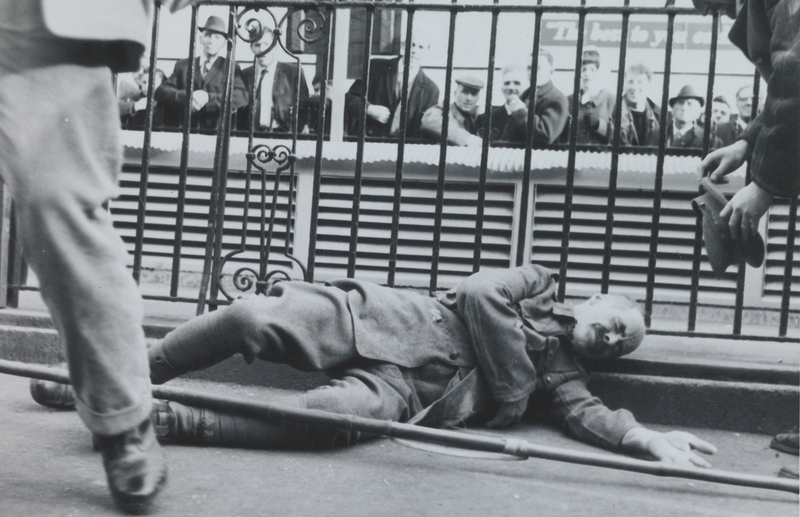 Despite these signs, as well as witnessing a gunshot on Harcourt Street, it was not until later that she learned of the outbreak of the Rising in Dublin the previous day. She went on to recount her experiences of the following two days. She was one of only four women to turn up for the Tuesday examination, which was held in the Dining Hall, and afterwards they were invited to dine with the Provost and his daughter Elsie Mahaffy. The Dublin University Officer Training Corps were on hand to defend the College until the arrival of a detachment of British troops on the Wednesday evening, but the students nevertheless were forced on occasion to dodge the rebels’ bullets, which became more frequent as the fighting intensified over the next few days. 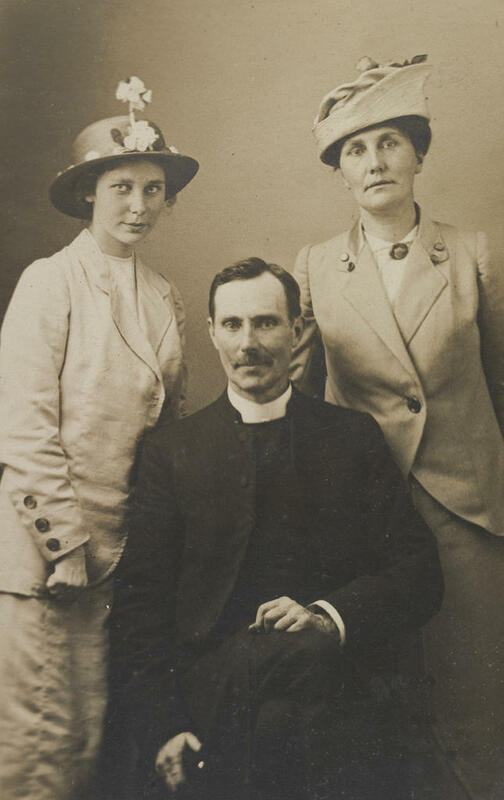 But what of the other three women who braved the danger of sniper fire to attend their Trinity term exams on Easter week of 1916? Luckily, the College Archives contains a wealth of information on Trinity students, mainly in the form of entrance records, examination and lecture returns and degree signature books. A volume of examination records for 1916 lists the names of the Junior Sophister students (18 in all) who – like Eileen Corrigan – presented themselves in College on 25 April. The four female students were Eileen Corrigan, Violet Mignon Couser, Muriel Cullinan, and Annie Eleanor Notley. An account by one of these students, who signed herself only as ‘Miss C.’ appeared in ‘A History of Trinity College Dublin’, published by TCD Publishing Company in 1972. 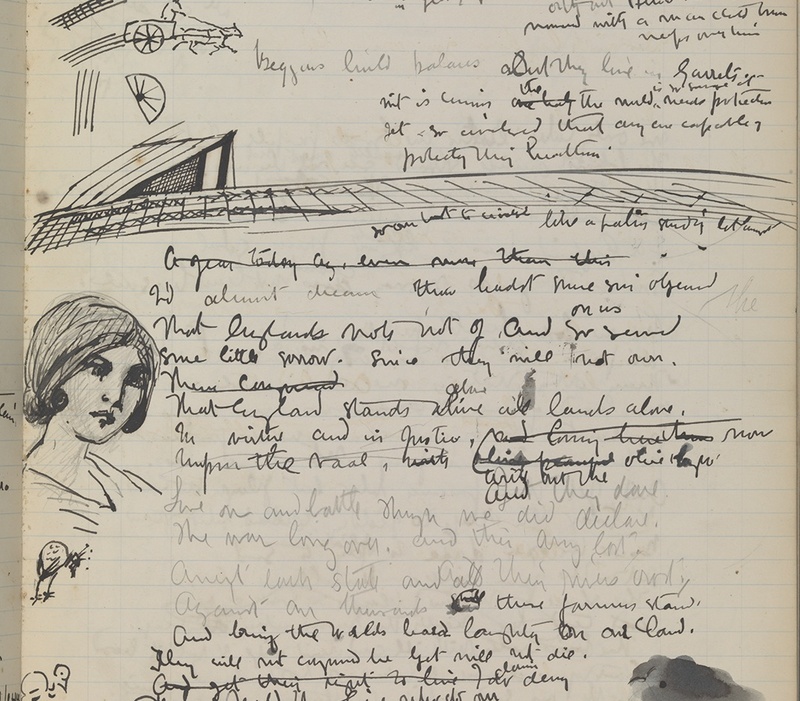 Her description of the two exam days tallies with that of Eileen Corrigan: sitting the exams in the Dining Hall; taking lunch with the Provost; gunfire in Brunswick Street and surrounding areas; having to exit the College at the Lincoln Place Gate. 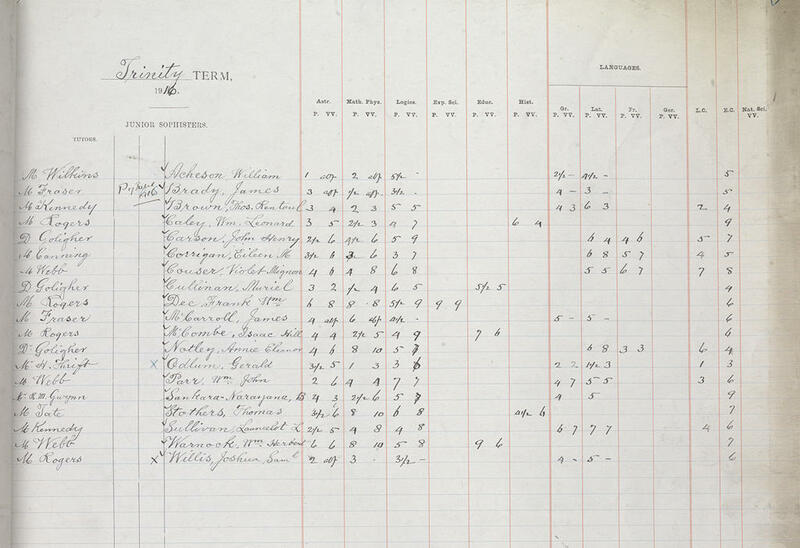 A little further investigation, with the aid of information supplied in the article, cross-referenced with 1911 census returns, reveals that the author was Muriel Cullinan, who lived on Fitzwilliam Square, not far from TCD. Who knows what memories were forged in the minds of the other men and women who sat their Junior Sophister exams in the midst of one of the most important events in Irish history. 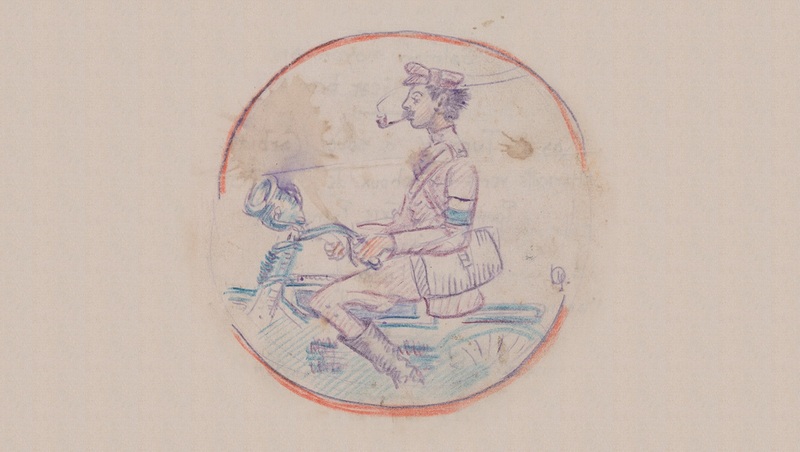 More information relating to Corrigan’s experiences during that period in April 1916 is to be found in a small collection of documents presented to Trinity College Library in 1966 by Eileen herself, (TCD MS 3987a). 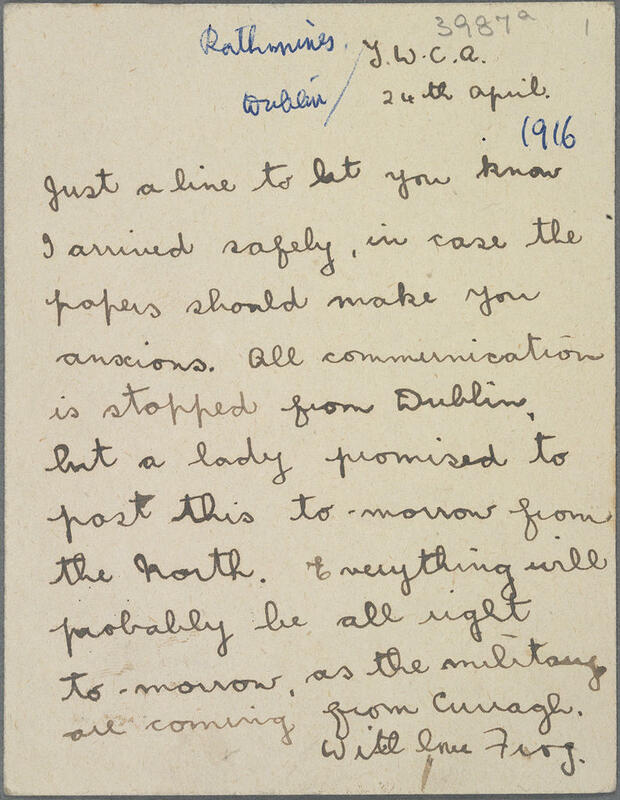 As well as the newspaper article, there is a postcard she sent to her mother in Belfast on Easter Monday to announce her safe arrival in Dublin. 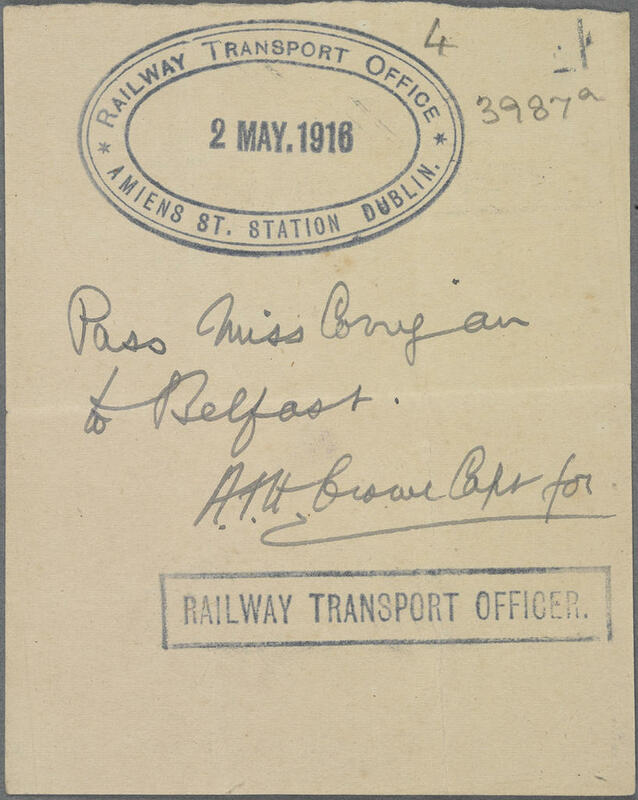 It is clear that this postcard failed to arrive at its destination on time as there is also a pass for her concerned father the Rev William Corrigan to travel to Dublin from Belfast on 2 May to find his daughter.